Rev. Frank Strine (right) passed away at 10:30 pm on Thursday, September 29, 2016, in the hospice wing of Huntington Parkview Hospital in Huntington, Ind. He was 91 years old. Rev. 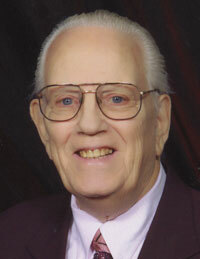 Strine attended Huntington University, was ordained in 1968, and pastored several different United Brethren churches–including congregations in Coldwater, Camden, and Montgomery, Michigan–before retiring in 1986. Funeral time: 2 pm Saturday, October 8, 2016. Visitation one hour prior to the service. Funeral location: Union Church, 3688 E 400 N., Huntington, IN 46750. Frank Strine was born in Goshen, Ind., in 1925 and served in New Guinea and Australia during World War 2. He and Phyllis, married in 1951, had four children, all of whom graduated from Huntington University. Bruce and Devon became ordained United Brethren ministers and served UB churches in Michigan, Ohio, and Indiana (Bruce began pastoring in another denomination in the 1990s). Daughter Donalynn Strine was heavily involved in leading UB Bible quizzing. Another daughter, Maddie Grubbs, lives in Florida. Memorial donations can be made out to the Strine family in care of Myers Funeral Home, 2901 Guilford St., Huntington, IN 46750. 85 students enrolled in professional programs. 25 students in the new Haupert Institute for Agricultural Studies. 34 new students in the Doctorate of Occupational Therapy program, for an overall total of 98 students. The Pachecos at Mt. Hope UB church in Carson City, Mich.
Milton and Erika with Nancy N’Gele, a former UB missionary in Sierra Leone. 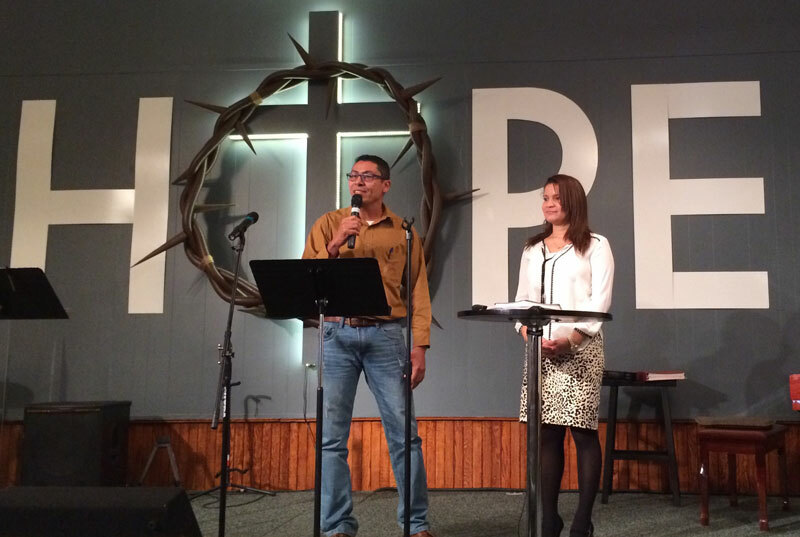 Milton and Erika Pacheco, a couple from Honduras, plan to join our team in Thailand in early 2017. They are currently in the States speaking in United Brethren churches and raising support. On September 18, they visited Mt. Hope UB church in Carson City, Mich. There, they met Nancy N’Gele, who served 11 years as a missionary in Sierra Leone. Here is the Pachecos’ schedule through the end of November, in case you have opportunity to go hear them. In some churches, they will also do music–a very talented couple. September 18: Mt. Hope UB church (Carson City, Mich.). September 25: Franklin UB (New Albany, Ohio). October 2: Otterbein UB (Greencastle, Pa.). October 9: Heart o’ the Lakes (Brooklyn, Mich.). October 16: New Horizons (Rockford, Ohio). October 23: Mt. Zion UB (Decatur, Ind.). October 30: Clearview Hispanic (Goshen, Ind.). November 6: Fountain UB (Keyser W. Va.). November 13: Salem UB (Chambersburg, Pa.). November 20: Eden UB (Mason, Mich.). Each summer, Global Ministries provides a mission project for local churches to promote during their summer children’s ministries. Materials are prepared in advance so the children learn about the ministry they are supporting. The project usually relates to something of interest to kids. In the past they have contributed to the needs of Syrian and Iraqi children living in refugee camps in Southern Turkey and have supported our Mexican United Brethren children’s outreach ministry. This year the focus was on children’s ministry in Guatemala. 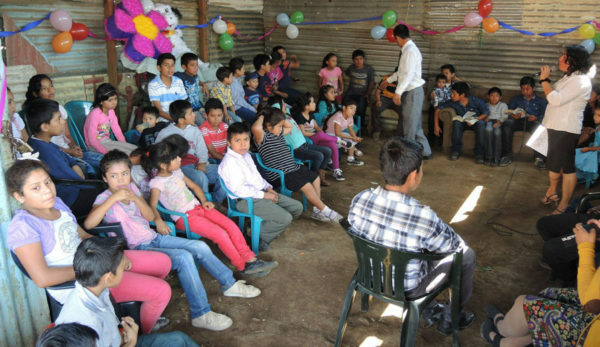 Once again, we are amazed at the enthusiasm and sacrifice of our children who raised $7895 to purchase teaching materials and improve the spaces where children gather for Sunday school and outreach activities in Guatemala. On behalf of our Guatemalan United Brethren, we thank all our children for their prayers and support of this ministry. The UB History course will be taught October 10-11, 2016, at the UB national office in Huntington, Ind. This course is a requirement for ministerial licensing. However, people who just want to learn more about United Brethren history are free to take the course. Go here for complete information and to register. Time: 9 am – 4 pm each day. Location: United Brethren National Office. Address: 302 Lake Street, Huntington, IN 46750. The instructor is Bob Bruce (right), associate pastor of Emmanuel UB church (Fort Wayne, Ind.). $200, if you are seeking a ministerial license. There is a $25 discount if you pay fully in advance of the class, making your cost just $175. Lodging can be secured at the Comfort Inn Huntington for $95 per night plus taxes. You can request a reservation through the online registration form. This course is held periodically in regional settings. During the past four years, 125 people have attended the course in about 20 different locations. Bishop Todd Fetters (right) conducts the ordination of Eldon Grubb. Assisting are elders Duane Walters and Lee Rhodes. 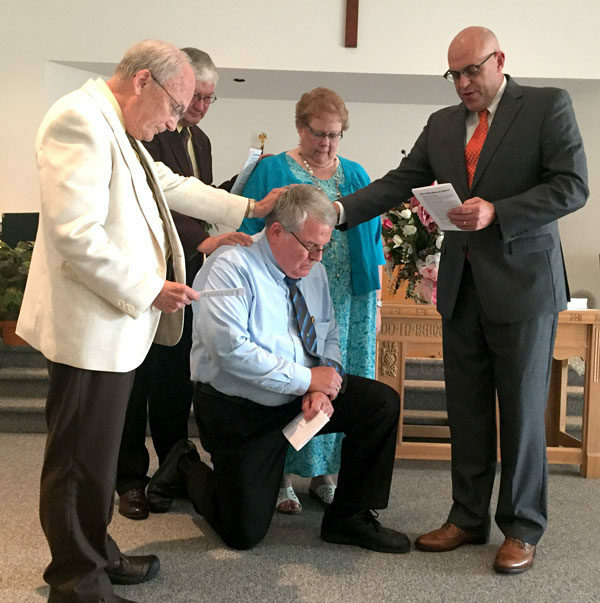 Eldon Grubb was ordained at a United Brethren minister on Sunday evening, August 18, at Pleasant Valley UB church in Lake Odessa, Mich. Bishop Todd Fetters conducted the ordination service. Eldon Grubb, a graduate of Grace College (1977) and Grace Theological Seminary (1983), and his wife, Denise, have served Pleasant Valley since 2011. The 2016 Hillsdale outdoor service at the Michindoh Camp and Conference Center. 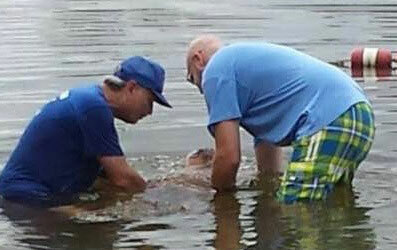 Pastor Les Smith (left) and his son-in-law Eric, an ordained Wesleyan pastor, baptize Les’s grandson Titus Eisenmann. The Hillsdale UB church (Hillsdale, Mich.) is 112 years old. They held their 18th annual outdoor service at Michindoh Conference Center on Sunday, August 28. There were over 600 in attendance and 90 more at the earlier indoor service at the church. The 715 total attendance is a new record for a non-Easter Sunday. Both services included a visit from the “Apostle John” portrayed by Pastor Les Smith. The platform became the Island of Patmos as the first five chapters of the book of Revelation were dramatized. The outdoor service continued with the crowd walking down the path to Lake Weatherwood for a baptismal service. On July 14, 1935, there were 19 people baptized in a single day at the church. It was a record that stood for over 80 years, but was eclipsed by the 20 who were baptized at Michindoh on August 28. Afterwards, 625 were served a picnic meal at the Pavilion. The majority also took advantage of the water recreation later that afternoon. L-r: Julie Hui, Brian and Rachel Glunt, and Milton and Erika Pacheco. The Global Ministries church planting initiative in Thailand is the largest United Brethren missions venture since Macau in 1987. It is a multinational effort, with people coming from four different countries. 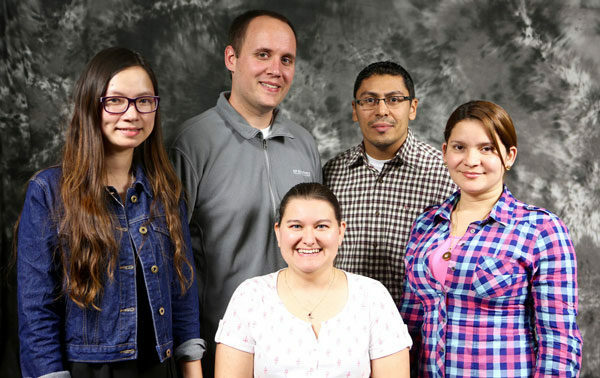 A family of five recently arrived in Thailand, and five other missionaries will soon join them. Here is an update on what is happening now, and what lies ahead. Several missionaries are still raising support, so at the end you’ll find opportunities to come alongside them. Brian and Rachel Glunt, along with their three children, arrived in Thailand on August 9. They are from Emmanuel UB church in Fort Wayne, Ind. The Glunts are getting settled in, taking care of such things as locating a home, finding a vehicle for a family of five, getting their kids into school, opening a bank account, etc. For now, they are living in a condo hotel, kind of like an extended stay hotel. Julie Hui and Lai Au Yeung (right), from Hong Kong Conference, will join the Glunts in October. They are being fully supported by Hong Kong Conference. Erika and Milton Pacheco, from Honduras, will likely join the team in early 2017. They continue to raise their support. Since it will be difficult for Honduras Conference to fully support them, the Pachecos will come to the United States this fall to develop partnerships with United Brethren here. That brings us to the latest addition to the team, Paula. Since she comes from a sensitive country, we can’t publish her picture or give details about her via any internet media. However, we are very excited by what she brings to the team. Paula attended a top-tier university in her country, and became a Christian when a friend took her to a house church. Since then, she has been fervent in sharing her faith. 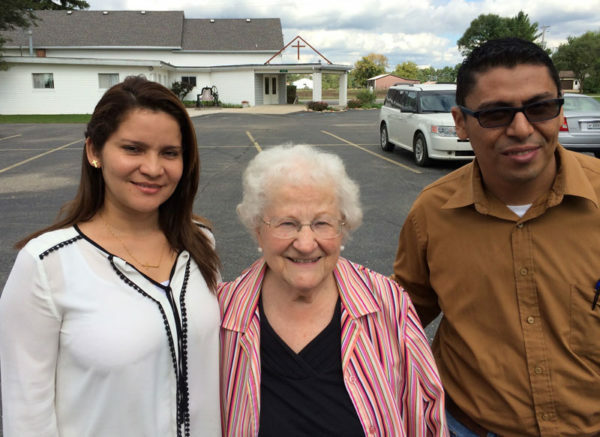 During one 40-day stretch, she set a goal of sharing the Gospel with one new person each day. She also shared with every member of the company where she worked. We became aware of her in a roundabout away. She was helping another mission organization by serving as translator for short-term mission trips (her English is excellent). I was told about her by a member of one of those teams. When she came to the States earlier this year to visit friends, I met with her. Though she held a good, secure job in a major city, Paula was brokenhearted for the unreached peoples around the world. From our first conversation, she mentioned going to unreached people groups and working among the nations. This impressed me, because I haven’t met many people from her country who talk about unreached people groups. Over the course of several months, we got better acquainted. Finally, this summer, the Global Ministries team had the chance to formally interview Paula and accepted her to join the Thailand team. We hope she can join the team in Thailand during the first quarter of 2017. It all depends on how quickly she can raise support. Coming from a small house church and a nonChristian family background, she has a limited base of support. We are bringing her to the United States in November 2016 so she can spend a couple months developing partnerships with United Brethren individuals and churches. During this first year, the entire team will focus on learning the Thai language and culture. Down the road, Thai will be the common language for the team. We took about ten research trips into the area to see how the UB work could fit into what God was already doing. We developed relationships with local pastors and missionaries, who are willing to help the Glunts and the rest of our team get oriented. A key contact is a missionary from Singapore—yet another country we can add to our international mix. In 2015, we purchased a building in Chiang Rai which will become our ministry center. We hope to thoroughly renovate the building during the next year; Hong Kong and Global Ministries (the US and Canada) will split the cost. Among other things, we will teach English and Mandarin Chinese. Learning Chinese is very popular in Thailand. Many Chinese tourists come to Thailand, and China is increasing its trade with Southeast Asia. A highway between China and Bangkok cuts through Chiang Rai, and there is talk of a high-speed train from China to Thailand. If you know English and/or Chinese, you have excellent job prospects. This is especially true in Northern Thailand. In Chiang Rai, all major street signs have Chinese, English, and Thai on them. The Glunts signed up for a program to learn the Thai language and culture. Julie Hui and Lai Au Yeung will attend at the same time. The Pachecos and Paula will start the program in 2017. The two older Glunt children are attending an international Christian school. The youngest child will attend a local kindergarten that is taught partly in Thai and partly in English. FYI: Bryan and Emily Gerlach, whom we sent to Thailand in September 2013 as the first members of the Thailand team, completed their first term and chose to work with a local church through another ministry in a different Thai city. They are now listed as United Brethren endorsed missionaries. The global church today is literally Christians from everywhere going everywhere. I love that our Thailand team encapsulates what God is doing in our world. This summer, I attended a Lausanne Conference in Indonesia. I met an ethnic Korean who grew up in China and holds a Chinese passport, and now works in Turkey and reaches out to Muslims. There are many such stories. Brazil is sending out massive numbers of missionaries. So is Africa. A majority of today’s missionaries are being sent out from non-Western countries. Our Thailand team is a reflection of the global church today—the first time that all of God’s people, from everywhere, can work together. Missionaries from the United States, Hong Kong, Honduras, and another country working together to reach ethnic Thais in Thailand. The Pachecos will be in the United States September 15 to November 23, living in the UB mission house in Huntington and visiting UB churches. They are already booked up on weekends, but are available for any weekday events or groups at your church. 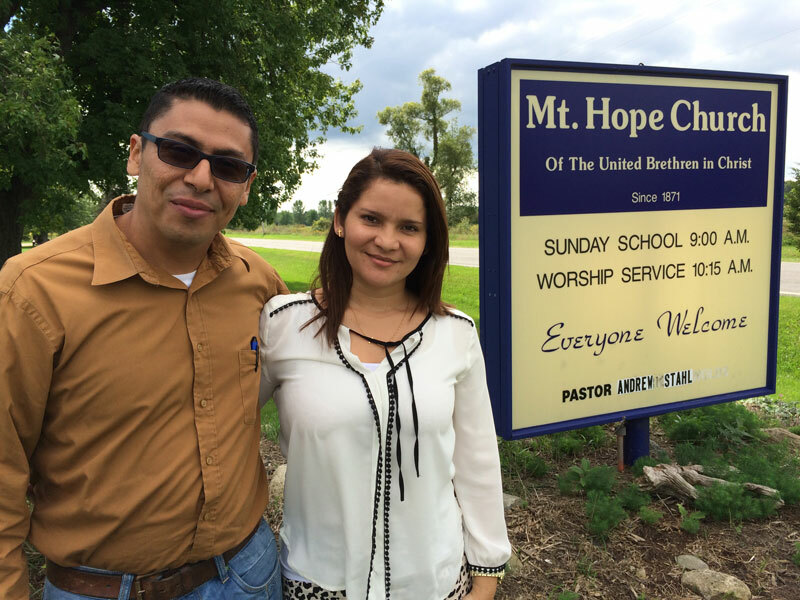 Milton and Erika have a unique Latin American perspective about what God is doing in Honduras. They are also very musical; in fact, they’ll be leading worship during some of their Sunday visits. Paula will be in the States from November to January, and is also available to meet with local churches. She can tell you exciting things about what God is doing in her country. 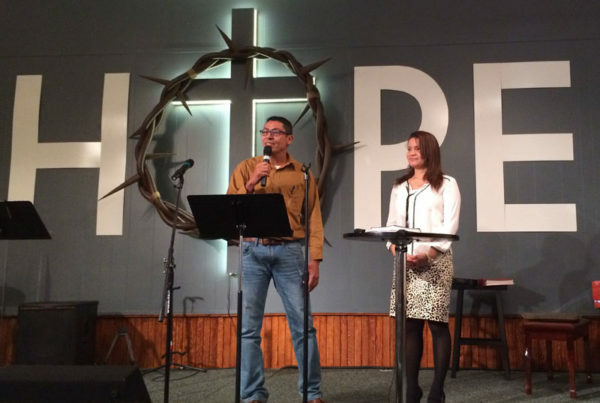 The Pachecos and Paula need additional financial and prayer supporters, and are available to meet with local churches. If you are interested in hosting any of them, please contact the Global Ministries office. You can contact Jana Gass, our administrative assistant, at jana@ub.org. Or call toll-free: 888-622-3019. Andy Bashore, with wife Stacey, receiving a local conference license from Lancaster UB church. Senior pastor Greg Voight is on the far right. 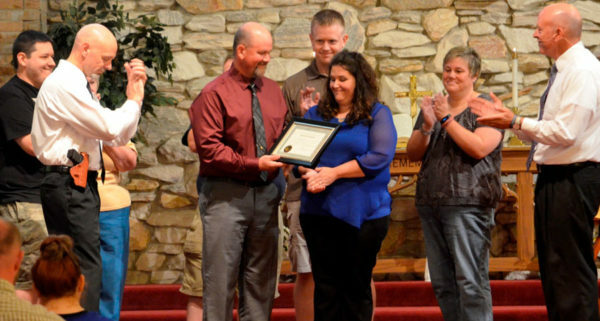 The Lancaster United Brethren Church (Lancaster, Ohio), recently awarded a local conference license to Mr. Andy Bashore. Andy is presently an elder and trustee, and he and his wife, Stacey, have just taken on the new role as youth directors. Andy will serve the congregation as an associate pastor under Senior Pastor Greg Voight. Quad occupancy: $120 per person. Triple Occupancy: $145 per person. Double Occupancy: $195 per person. Single Occupancy: $335 per person. The event fee is still $75. Join Other Women on the Bus! If you need a ride to Gettysburg, the Emmanuel bus still has a few seats. All you have to do is park your car at Emmanuel Community Church in Fort Wayne, Ind. The cost of the two-way, 500-mile trip is just $25. UBCentral.org is the news portal for the Church of the United Brethren in Christ, USA. The main site is located at UB.org.